At NYC Smile Design clients come to see us for a variety of smile enhancement concerns. One of the challenges that we are asked to address is the patient with long teeth that were not that way before. Teeth can get longer or appear to have gotten longer for a variety of reasons. And as teeth get longer, dark triangles will begin to appear between them. Gum recession exposes the narrow section of the roots making the tooth look longer and the dark space between them triangular. So let’s talk about the different reasons that this gum recession occurs and how we can correct them. 1) Gum disease or periodontal disease. Gum disease will slowly erode the attachment for teeth which are the gums and the bone. Cigarette smoking will also breakdown the important attachment that keeps teeth strong and stable and will eventually lead to loose teeth. Thin gum tissue is extremely fragile and can easily pull away from the tooth,exposing the roots. If crown or caps are made too bulky gum tissue may pull away as irritants and bacterial deposits accumulate around it. These different reasons must be addressed by dentists that are qualified to appropriately address them. 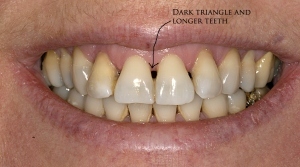 Handled properly, a long tooth with dark triangles can be corrected, cosmetically enhanced or in some cases reversed. Left untreated or inadequately addressed, loss of teeth is ultimately the end result.